Today let’s have coffee at the table, in the bump out of the little bookstore downtown. We can chat and watch the people go by. There is a bakery across the street so I will pick out a couple croissants for us. They have some delicious chocolate ones that will go perfectly with our elixir. I am having black coffee. What would you like from the cafe barista? While we are having coffee I will tell you about the video meeting with my writing group I had Wednesday night. It was life giving and motivating. I love these writers and it is easy for me to set up these times. While we are having coffee, I will tell you about the relief of knowing my car is fixed. I don’t like dealing with the bill but there is more relief than I anticipated as I drive every day. While we are having coffee I will tell you I have had many creative sparks this week. One is the video from Julie Duffy about getting ready for StoryADay May. I encourage you if you want a boost to your writing life to participate in the challenge this year. The prompts are free and there is support in the community. You can also set your own rules. I choose to write a story a day but you can write 4 or choose days to write. You can check out her cool video here. Another creative spark is the short story Saint Bus Driver by J.E. McCafferty. There are such great lines in this story. The discussion on Literary Roadhouse was fun too. It has stayed with me and I keep thinking about it. If you read it later and would like to talk about it please let me know! A third creative spark for me was perfect for April being poetry month. Billy Collins has created a Masterclass and I found it this week. I have made it through 13 of the 20 lessons! He is joyful to listen to. I use his poems a lot for use with kids. They are straightforward. It is inspiring to listen to him talk about writing technique. I am always learning! A fourth creative spark this week is the Pink Full Moon. Do you need a refill on your coffee? I am going to get another. I think before we leave we should wander the stacks and find at least one book to recommend to each other. While we are having coffee I will tell you I wrote everyday. I sent a story to a contest. I am getting mentally ready for storyaday May and excited about it. I tend to binge listen to the StoryADay podcast right before! There are lots of prompts and Julie’s voice is nice to listen to. Lots of notes go into Google Keep so I can write about them later. While we are having coffee I will tell you I read some great short stories this week. I am trying to be more diligent about logging my reading but find it cumbersome. I found a new to me flash fiction author, Meg Pokrass who I am enjoying. She was recommended by Amber Sparks who is a wonderful short story writer herself. While we are having coffee, I will tell you I feel like there are lots of decisions that are hiding around the corner from me. I am trying not to worry myself but there is something coming. It is not good nor bad, it will just be, but I can feel it looming! I am thankful for having The Next Right Thing book to help me navigate though. It brings me joy and focus. I am hoping to participate in a book club with this title soon. While we are having coffee, I would tell you our teaming consultant visited this week and was wonderful. The meetings with him, my writer video meeting, and some great short stories has refueled my passion for my Inner Circle Gathering Idea. I believe I can pull it off online. The first ones are being planned to use a short story and some activities surrounding the text and then doing some writing exercises as well. Let me know in the comments or a message to me directly at tammybreitweiser@gmail.com if you are interested. Thank you so much for joining me for coffee! I always enjoy our visits and today was no different. Let’s have coffee again soon! Here is the link to Eclectic Alli and her weekend coffee post and link up. Inspired by Emily P Freeman and her Instagram challenge. Day 9 – Make the List. The task is to make a list of what is Life Draining vs what is Life Giving. Today we are having coffee in a gazebo overlooking the mountains with the sun shining in on us just right. There is a stream that is rushing by us and we can see elk in the distance. The air is crisp and sweet. It is the perfect Sunday morning. I am having black coffee and just brewed a fresh pot. I have some add ins today for you if you like -some chocolate or some butterscotch. Even some whipped cream! If we were having coffee I would tell you it seems unbelievable that I was on Spring Break last week. It turned out to be a week of long days in a row which made it seem longer. Monday though Wednesday I didn’t get home til after 9 each night which is unusual, especially three days in a row. If we were having coffee I would tell you it was nice to get back into the swing of things at work again. I was able to work with some students this week in an English class which always makes me happy. The thinking that was happening was unexpected and out of the box. The discussion centered around analyzing digital and printed text with some reliable articles by Higher Ed and American Scholar . If we were having coffee I would tell you I attended my IRL writing group holiday party Wednesday. It was postponed from Christmas time due to some medical issues. There were about 40 people there. There was a dinner, book exchange, door prizes, and social time. Do you need a refill on your coffee? Mine needs warmed up. Do you need another napkin, or a glass of water? I am not ready for our conversation to end! If we were having coffee I would tell you I wrote everyday. I had my beta reader look over two stories for me. They are truthful stories, but deal with sensitive issues so I am not sure where I am going to take them next. They are not appropriate for my IRL group. I am scoping out a writer group in Chicago. They have author talks, readings, writing meetings, and critique meetings which appeals to me. If we were having coffee I would tell you my Bradbury Trio is still going strong. I received my Sarah Selecky story collection in the mail so I am excited to read her stories. Sara Batkie’s collection is on its way too. Sara I learned about from the Drunken Odyssey podcast which I was listening to on my run in the Dunes on Monday. Essays I think I am going to start looking at NPR. Do you have any suggestions? If we were having coffee I would tell you I had to take my car in for repairs on Friday. This process always makes me extremely nervous and I usually put it off way too long. I found a great garage and the actual problem only cost a little over $300. The other things I added on were needed but not emergency so at least it was a choice. The car has been all over the country and we love her dearly! I want her to run for a long time so some belts needed changed and a tune up and transmission fluid change was necessary. She is running well again and I feel safer. If we were having coffee I would tell you last week I said would pull some coaching materials together in a more formal way. I have started with some forms and pushed one out to a teacher. I also sent out the email about a mini coaching cycle. I like the idea of thinking about coaching as having deep conversations that I crave. The coffee is brewing and the twinkle lights are on in my office. It is the simple things that are part of my routine that make the day go smoother! I have already made rounds talking to teachers this morning. I had to follow up with a couple people about videos that were taken of their students before we left for break. I needed to get the reflection forms to them before any more time went by! Today I want to share a quote that I will be writing about today from one of my FAVORITE short story writers, Kelly Link. Today we are having coffee in my three seasons room. I am having black coffee and just brewed a fresh pot. I have some add ins today for you if you like -some chocolate or some butterscotch. The birds are starting to come out. They do like the trees in the front outside my bedroom window. I haven’t lived in this house in the Spring yet so we shall see which animals come to the backyard. If we were having coffee I would tell you this past week went super fast. It was a great week filled with “just enough” scheduled events but I am honestly not ready for it to end. I took a lazy day on Friday but something happened that made me angry and sadly it stayed with me a little too long. If we were having coffee I would tell you I had a great writing week. I wrote with a friend on Monday at a favorite local restaurant. It was nice to meet, talk writing, and write “independently together”. I had a Zoom call with my online group and I also had a one on one session video conference with a writer friend on Thursday. I wrote at the local library yesterday which was a different experience but enjoyable. If we were having coffee I would tell you I had a good reading week too. I went to Powell’s in Chicago and bought 3 books. I could have purchased more but used restraint. I read essays and short stories and poems everyday. If we were having coffee I would tell you I am playing with plot structure for my Camp NANOWRIMO stories. Camp NANOWRIMO is a month long community writing event that is more lax than regular National Novel Writing Month. My goal is just over 10,000 words total divided between 4 stories. I am working with the plot structure to hopefully help my writing get better and show me what I am missing in my stories. A couple resources I already have are the Ninja Writer’s plot class that I discovered I already owned, the Eva Deverell’s One page novel formula, and the Save the Cat structure. If we were having coffee I would tell you I had wonderful meals out this week. We do not go out to eat often. My husband is a great cook for one but also with 4 children it can be an expensive endeavor. We went to a local place in the town we used to live where they have great hot dogs, fries, and steak sandwiches. We also went to a local “stuck in time” steak house. It was divine and a wonderful date night. If we were having coffee I would tell you I am thinking about decisions. Big ones and little ones. 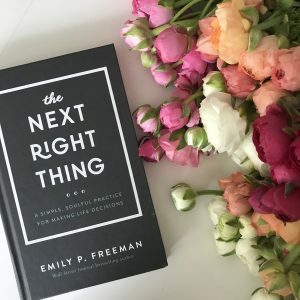 This is partly because Emily P. Freeman’s book The Next Right Thing came out Tuesday, April 2. I have the digital copy, the audio, and the hard copy. I do love the hard cover and have been gravitating towards it. If we were having coffee I would tell you I did not listen to the normal amount of podcasts I do during a typical work week. I did listen while at the gym but did not get through the input I normally consume. If we were having coffee I would tell you I am still on my Bradbury Trio roll! I DID make a spreadsheet! If we were having coffee I would tell you that I have been lax in keeping track of my connections for my word of the year. I have been connecting with other writers through the SLACK channel, Twitter, and even in real life which has been fulfilling. I have not attended the writing group however since January. The location had changed the last couple of meetings and it didn’t seem to fall on a good evening. There is a celebration next Wednesday I plan to go to so that is exciting. I have not felt very social lately to be honest. I am trying to figure out why. There is a saying that the 5 people you surround yourself with influence you greatly. I guess friends and connections is part of the decision making we talked about earlier. April tends to be a hard month for me for connection. The month reminds me of grief. If we were having coffee I would tell you I have been thinking of pulling some coaching materials together in a more formal way. I have started an outline and pulling resources I already have. I have an email partially written to send out next week for my teachers as well to do a mini coaching cycle. We shall see how that goes! I am excited to synthesize some different items together that I have been using for years. If we were having coffee I would tell you, this year I enjoyed the slice of life challenge as I do every year but something about this year was special. The caliber of writing was great as always but it seemed there were a lot more teachers who completed the challenge. Congratulations to every one who wrote and a special congrats to those who wrote all 31 days! If we were having coffee I would tell you I think this coffee post is the perfect one to end the month with for the challenge. It has been met with the most commentary. I am drawn to the conversational form and love that people love it. In the challenge, I am blessed to have met many wonderful teachers I would not have any other way. The group was interactive and allowed me to connect with people all over the world. I really hope it continues. If we were having coffee I would tell you I have high hopes for April. I hope teachers will continue to write at least once a week. I hope they will link to their blogs on Tuesdays.I hope the commenting will continue.I hope these writers will notice how powerful their daily practice is and share that experience with students. I hope to see some familiar names at CAMP NANOWRIMO. If we were having coffee I would tell you I am now on Spring Break and am so happy! It is going to be a good writing day tomorrow! I am meeting a writer friend and I also have a writers group Zoom call in the evening. If we were having coffee I would tell you the rejections came in last week and it made me sad. I really had to get into a different mindset after a few came one after another. I am emotional about 5 days a year and one of those days was this past week. If we were having coffee I would tell you I am thinking about silence and slow living. I am thinking about being intentional especially about time. Part of this thinking is tomorrow is the anniversary of my Oma’s death. I miss her all the time and I can hardly believe it has been 19 years now. Do you need a refill on your coffee? Another napkin, or a glass of water? If we were having coffee I would tell you my top productivity tool has to be Google Keep. I share dictated and typed notes with myself. I make notes from podcasts and reading. I save websites and stories to read and pictures. I can make it into a Google doc and just transfer what I need from the app or opened in the browser. I can open up Keep on the right side of my screen and scroll through different notes to add to one document in Google too! I LOVE IT! If we were having coffee I would tell you I am still on my Bradbury Trio roll! I have been reading poems from Paris Review. I am reading Neil Gaiman, Kurt Vonnegut, and Octavia Butler essays. I am reading William Maxwell short stories and others. I SHOULD make a spreadsheet…. Grab your cup of coffee and sit in a comfortable chair around this oak table and let’s chat! I am having my regular black coffee this morning. I am on my third cup though. I have been really tired all this week. If we were having coffee, I would tell you I am participating in the Two Writing Teachers March Slice of Life Challenge. Teachers all over the world are posting on their blogs daily and at the TWT blog and then comment on at least 3 posts. This weekend there is a comment challenge so there will be lots of activity. If the internet goes down blame it on the teachers! I commented every day and it is always great to interact with people. If we were having coffee, I would tell you I have had a training yesterday with Jim Knight. I drove into the city which always feels sophisticated to me. They had moved our tables which was jarring! This is a series of workshops and the same group meets every time. We have one more session next month. I spent a lot of the time talking to the coaches at our table. The materials are always great. We talked about learning maps which is something I will bring back to my office. It is a visible learning plan for students and teachers. There were times I had a hard time focusing throughout the day because I had woken up at 2:30 am. I had multiple little baby cups of coffee. I had great conversation about writing with a gifted classroom with an elementary coach too which was fun. If we were having coffee I would tell you the conference I want to go to in November has posted the registration this week. I cannot sign up quite yet but will. There are studies that show the more you anticipate something the more happiness you glean from it. I will be taking full advantage of this fact with the writing conference in Salem! I have been there once. The Sunday before I ran the Boston Marathon I spent the day walking around the city. It was fascinating and I cannot wait to go back. If we were having coffee I would tell you I read at least one essay, one poem and one short story every day this week for my Bradbury Trio. I found the formats and the ideas finding their way into my writing this week which is a good thing. The essays mostly were Ray Bradbury and Natalie Goldberg. If we were having coffee, I would tell you a teacher left our building in the middle of the year. She had her reasons and I support her, but I am sad about it. She is the second math teacher to do it this year. I feel bad for the kids. Some of them are not dealing with the feelings of abandonment well. If we were having coffee I would tell you my writing has been all over the place. I wrote every day but I am not working on any particular short stories. I do have the rejected flash fiction story I want to revise and send back out this weekend. I plan to work on some longer word count short stories for the month is April. I also will get 3 critiques back on another story from my group so I will be able to revise it next month and send it out too! If we were having coffee I would tell you I loved this chat with you today! It really is a highlight of my week. What is the best thing that happened to you today? I would love to hear about something inspiring you read.